Linas Group is operating in area of mini refinery around 15 years. Till middle of 2014 Linas Group operates in Russia only. It gives plenty of technological and commercial experience and confirms industrial advantages of Linas rectification units. At September 2014 Linas Group begin first project outside of Russia in Republic of Kazakhstan. Market of mini refinery business outside Russia was not clear for Linas Group. Therefore a special market research related to mini refinery business in developing countries was done. This research shows large potential of mini refinery market in developing countries because of several reasons. In area of refinery relative small developing countries have some general features. Many developing countries do not have refinery at all. These countries do not have reasonable fund to invest in conventional large refinery. These countries need oil products and demand increases from year to year. Many developing countries have source of crude oil. So, developing countries needs oil products but conventional way to construct large refinery could not be implemented. Linas Group developed concept of mini refinery for developed countries. Oil products are oriented on local market. 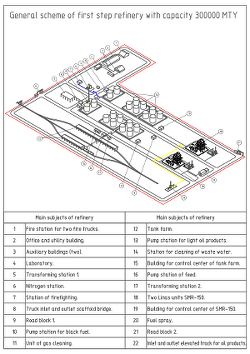 Two or three steps construction of refinery from relative small capacity to reasonable capacity. Using of existing petroleum storage depot and engineering infrastructure. Simplest oil products from first step of refinery. There are several versions of first step of mini refinery in developing countries. First version. The version is cheap and fast. This version is based on existing petroleum storage depot and engineering infrastructure. All developing countries have petroleum storage depot because they import oil products from somewhere, store oil products and distribute the products to local customers. Potential owner of refinery may buy petroleum storage depot and use this storage as tank farm of refinery. Adding to tank farm two Linas rectification units (for example two SMR-150) with scaffold bridge between units and tank farm constructs basic refinery for production of three oil products straight run gasoline, diesel oil and black fuel. Duration of first version is around 15 months. Atmospheric distillation of crude oil. For example it could be two Linas units SMR-150. Tank farm with volume around 25000-30000 m3 with pumping stations. Truck feed inlet and oil products outlet. Best location of the refinery is close to sea port. Duration of first step is 18 months. Low level of investment. According to our estimation cost of first step with capacity 300000 MTY is around $60-80 millions and depend on local conditions. Duration of first step is very short (15-18 months only). First step of refinery is good basis for further development of the refinery. Enlarge of capacity till 600000 MTY. For example, by set of two SMR-150. Additional capacity of tank farm. For example – 24000-30000 m3. Using advanced technology for production of high octane number gasoline and high quality diesel oil. Reforming and hydro-treatment have to be set. Additional engineering structure and pumping stations have to be set. Relative low level of investment. According to our estimation cost of second step is around $110-140 millions. Oil products will be improved very much. The refinery will be able to supply high octane number gasoline and high quality diesel oil with low content of sulfur. Duration of second step is short (24 months only). Second step of mini refinery could not be a final step. Owners of the refinery may enlarge capacity (for example till 1.000.000 MTY), improve quality of oil products and enlarge amount of technological processes. The refinery could be a good basis for development of petrochemistry and chemical industry in developing countries.